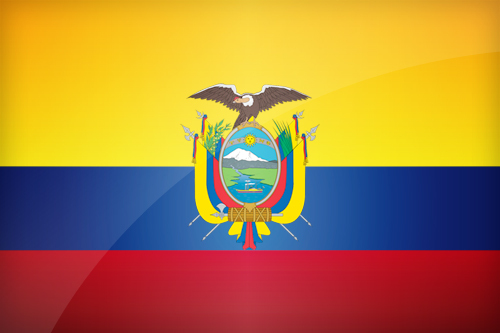 The Ecuador flag was adopted on 26 September 1860. Like that of Venezuela, it directly relates to that of Gran Colombia, and is very close to that of the current colombian one. It consists of three horizontal stripes : yellow - blue - red. Above are reproduced arms of Ecuador. Yellow symbolizes the great wealth of natural and mineral (mainly gold), blue recalls cloudless skies of Ecuador (which is an allegory of the future), and the red, blood shed by freedom fighters. Coat of arms represent a Andean condor perched on a crest suggesting a natural landscape incorporating various symbols of glory, triumph or brotherhood. You can download it in different sizes, in a decidedly modern design for your personal use, or for wider use. Ecuador's flag is available in 4 different sizes. Keywords: Flag ecuador wallpaper, Ecuadorian, Republic of Ecuador, National ecuadorian flag, banner, pictogram, country, icon, Ecuador icon, international, Quito, Guayaquil, Quito, Cuenca, South America.